Best practice for turning the balboa? Should I use the encoder or drive_ticks? Until the time.sleep(0.5). I’m trying to make the Balboa turn through 90 degrees to the left or right but there’s no time argument available to pass to the balancer.drive(int, int) call to tell the motors to spin for a fixed length of time before stopping. Is there a better way to do this? Should I use short for loops to adjust the speed of the motor to get it to turn in an orderly and measurable way? Could you try adding some debugging output by printing some short messages before and after time.sleep(0.5)? That should help narrow down where the program is getting stuck. So it doesn’t really tell us much I think. The only way I can see of breaking out of the loop is if Balboa32U4.motors in BalboaRPiSlaveDemo.ino has a milliseconds argument to run the motors for a fixed length of time. It doesn’t look like that code is available to modify though. I’m not really sure what’s going on to cause your program to get stuck on the time.sleep(); I’ll try to look into it later today or sometime this week. There isn’t a way to pass a duration to the slave program because all the commands are designed to immediately take effect (e.g. set the motor speed), and there’s no mechanism for either delaying an action or scheduling an action for a future time (with the exception of some buzzer functionality). Doing the wait on the Python side seems like the better way to do it to me, as long as we can figure out how to make it work correctly. I tried running some test programs in a virtual machine yesterday and was not able to reproduce your problem; the drive_test() function executed fine, other than causing Flask to raise an error afterward because it doesn’t return a valid response. I can try it on an actual Raspberry Pi, but in the meantime, could you also post all of your source files so I can look at the complete code you are using? Thinking about it Kevin, would it be quicker if you post your working code because the above won’t work without the VL6180X ToF sensor? Thank you kindly for your help! balance.py is unchanged from what’s in the RPi slave library repo, but the rest contains dummy implementations of the A-Star and sensors so that I could test the Flask part in a VM. I haven’t been able to look at your code yet, but I’ll try to see if I can get it running on some actual hardware today and reproduce your problem. 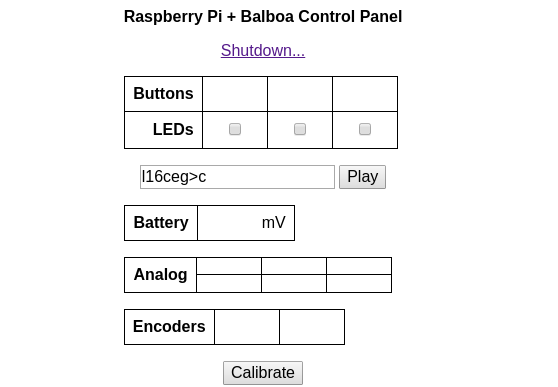 I’m testing your code on an actual Raspberry Pi and Balboa now, but with the VL6180X still dummied out, and I noticed that loading the drive_test page results in the error NameError: name 'time' is not defined because you don’t have import time in your server_balboa.py. Could you check if that is the problem? I’m thinking you might have missed that error message since it doesn’t appear in the log file, only on the server console and on the drive_test page (if viewed in a browser). The behavior I saw is otherwise consistent with what you reported: the program seems to stop exactly when time.sleep() should run. Hi Kevin, yes that works - many thanks. Such a small thing and a goofy oversight. It wasn’t apparent to me because I run the script as a service and not all of the console messages appear in the service status. For the purpose of this topic question, I think this can be closed. There is another issue below which has emerged, but I’m happy raising another thread if that’s preferable. This issue might be arising because I am now connecting to the RPI as a closed network wireless client, with hostapd and dhcpd configured to broadcast an SSID without Internet connectivity. I observed your suggested fix (and a very basic one) working once but then something went awry and I can’t seem to right it. Now when I run the server_balboa.py using the vanilla github code, I get the following error, even after rebooting and resetting the 32U4! The screen looks like this and the calibrate button doesn’t work. I am mystified. I’m glad to hear you solved the original problem. For the new error, since the error trace points to a problem in write_i2c_block_data, I would suspect some problem with the I2C communications. In particular, check that the second template argument for the PololuRPiSlave object in the Arduino code here is set to an appropriate value (which depends on your RPi model and the I2C speed you have configured). There are some notes on good values in PololuRPiSlave.h here. You can run the benchmark.py script in the pi directory to test I2C. Usually, if the delay argument is wrong, you’ll see an error when running the benchmark; if you can run it a few times in a row with no errors, it’s probably fine.